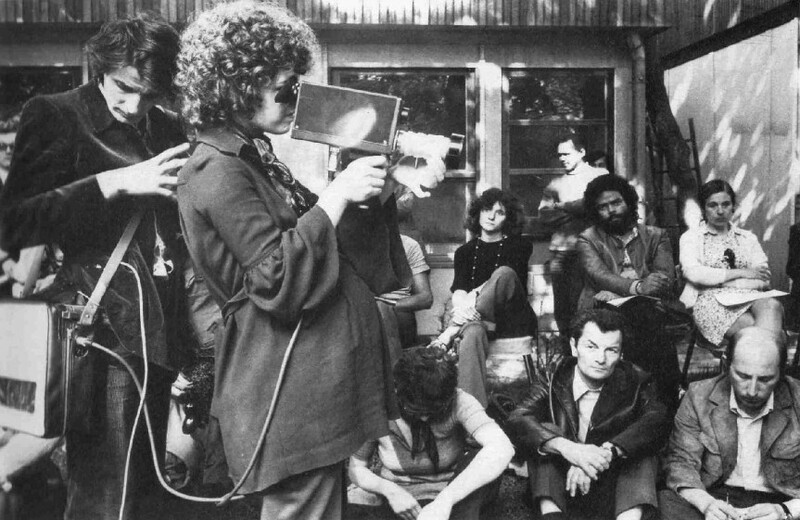 This selection of Roussopoulos’s early tapes begins with Jean Genet parle d’Angela Davis, which records both Genet reading a statement about Davis’s arrest and the indifference of a television crew on hand to broadcast the event. Le F.H.A.R. documents the first march and public meeting of the Homosexual Front for Revolutionary Action, a group whose founding members included writer Guy Hocquenghem, who appears as one of the meeting’s impassioned speakers. The program concludes with S.C.U.M. Manifesto, a collaboration between Roussopoulos and actor Delphine Seyrig that tonight will be paired with a live performance by Ridykeulous and special guest Dr. Laurie Weeks. Here video is used as a means of publishing Valerie Solanas’s infamous tract, which at that time was unavailable in France. Sitting in front of the camera, Seyrig dictates portions of Solanas’s text to Roussopoulos, who types them out while a nearby television blares the political news of the day. In the words of Solanas: Sometimes you have to scream to be heard. Alive since ’05, Ridykeulous is the collaborative effort of Nicole Eisenman and A.L. Steiner to subvert, sabotage and overturn the language commonly used to define feminism and lesbian art. Our efforts usually involve curation, intervention, publication, performance and highly-regarded affects on happenstance. Stuart Comer is Curator of Film at Tate Modern. Subtitles by Buyong Kim and Nottingham Contemporary.